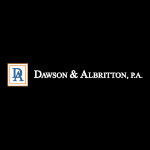 Follow Dawson & Albritton, P.A. About Dawson & Albritton, P.A. Attorneys Harry Albritton and Darren Dawson founded Dawson & Albritton in 2006 with a simple mission: To help injured victims and their families recover the compensation and benefits they deserve, and in doing so, hold negligent parties accountable. We have represented hundreds of injured individuals throughout North Carolina, and we have recovered millions in settlements and verdicts. We are ready to do the same for you.